i have thoughtfully included an illustration below of the drawing about which i will now wax lyrical. i do so because on reading this quite astounding novel by new zealander david coventry, i identified parallels with frank auerbach's tree at tretire that simply did not go away, no matter how much closer i came to page 311.
a british artist of german origin, auerbach was born in 1931 and formed a part, however, briefly, of the so called bomberg school, an agglomeration of painters who are often identified by an early predilection for producing works in oils ascribed in heavy impasto (thicky applied paint). auerbach seemingly followed a similar technique whether painting with oils or drawing from life using charcoal. it is something of a truism that artists rarely, if ever, describe their subject matter correctly, or to their own satisfaction at the first attempt. auerbach, in similar manner to leon kossoff, would simply scrape off the days' work from board or canvas, leaving behind traces of inscription which would form the basis for later continuance. the same applied to works in charcoal, where each removal of charcoal with a sturdy cloth or eraser, would inform subsequent re-workings, seemingly minimising the number of marks on each occasion. thus, the illustration published below, describes a tree seen from the upstairs window of a house at tretire in hertfordshire. 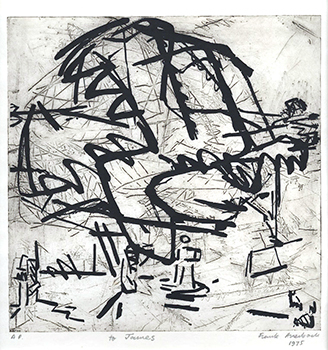 a series of drawings and etchings representing the subject originates from the mid-seventies. i am deeply impressed with how this drawing makes me feel, eliciting a deep admiration for auerbach's integrity and tenacity in reproducing the three-dimensional reality of a the 'real' world upon a tactile, yet two dimensional surface. the final work displays an impressive economy of marks describing one of the most fiendishly complex of subjects. and in a similar manner to coventry's the invisible mile, i simply don't understand it. which, i might add, is an excellent state of affairs as far as i'm concerned. 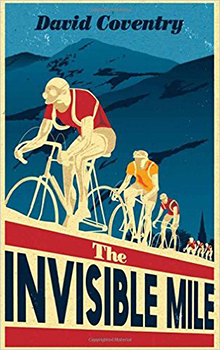 the invisible mile, though essentially a fictitious novel concerning the 1928 tour de france, has its basis in fact. the main protagonist, or at least the principal narrator, is a member of the first english-speaking, new zealand-based team to compete in le tour. the exquisitely written narrative describes the monotony, hardships and gruelling daily toil imposed by a race that, at the time, was still ridden aboard heavy steel bicycles with nary a derailleur in sight. though entered as a team, there seems to have been almost an 'every man for himself' regime that would find today's lead-out trains quite beyond belief. as coventry makes mention in his end note "While this novel is primarily a work of fiction, I have attempted to utilise historical data as much as possible, stepping outside or shifting the framework when need be." in my experience, cycling novels, as an independent genre, tend to be less than successful, predominantly due to a tacit misunderstanding of the professional cyclist's mètier, or an attempt to be too overly technical to encourage enjoyable reading. though there may be one or two individually successful attempts of which i know not, the last fictional work of note would probably be that of tim krabbé's 'the rider'. david coventry has successfully negotiated many of the potential pitfalls, offering the reader a novel that easily transcends its denoted subject matter with a beauty of narrative, an underlying, yet seemingly hidden, complexity and a narrative that is as compelling as it is deep. "I wave as I push off and begin my descent towards the floor of the valley from which I see the first big climb ahead under the new sun. I will catch my team by rising quickly, that is my plan. But before that I will crash and crash again and I will search the sky for shapes, and for clues as to what those shapes might be. I look back and wish I'd said what I think now, that I have in my head now; all stories are rhythm, and all rhythms return." the story is, in essence, simple enough, detailing the racing tactics of the narrator and his team members across the distances and terrain dictated by a french tour of the late 1920s. there are distractions of a non-racing nature; there are deflections backwards to the world war that ravaged much of mainland europe in the previous decade. these are all intricately woven together as a verbal tapestry that veers exceptionally as close to tactile reality as does auerbach's tree at tretire. which conveniently returns me to the subject of comprehension. in my eyes, but not necessarily applicable to each and every similar situation, this is a truly epic end result. it bears all the hallmarks of watching kubrick's 2001: a space oddysey. (admit it; you didn't understand that any more than i did.) the invisible mile is a resounding triumph. easily the best book i have never understood with cycling in it. "I open [my eyes] to see a mass of yellow nodding heads: sunflowers just outside of an unnamed town like a soft sea on the surface of the sun. Nodding heads like the cawing crowds that line the streets, that yell at us and summon us foward, nodding like they know something that we can't possibly know."